e-Van Transportation recommends Licenced Waste Disposal specialists offering Furniture Disposal in Carlow. If you need to dump old furniture, e.g. 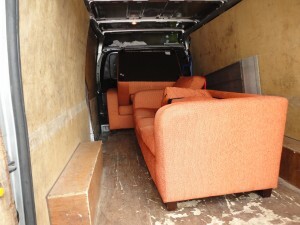 Sofa Disposal in Carlow and require a larger vehicle because you cannot fit these large pieces of furniture into your own vehicle, or because you don’t own a vehicle, your local collectors offer the ideal solution for Carlow Furniture Disposal. Licenced waste collectors will recycle/dispose of all waste responsibly at authorised recycling facilities/dumps in Carlow. The price your local collector quotes you takes into account the disposal fee and the fee for collection and transportation. The disposal fee that the collector pays at the dump/recycling facility in Carlow varies depending on the material and on the weight. For some items, they are charged by weight. For some items, they pay a set price for each item. Some items are free to recycle. The price quoted for collecting, transporting and dumping/recycling your items takes into account the price they estimate they will pay at the dump/recycling facility, and factors in the time a job will take, mileage and tolls (if applicable). Based on what you request be to dispose of and the weight they estimates it will be, your local waste in collector Carlow will tell you the total price they will be charging you.